It does not matter if your home is new or 10-15 year old. Garage floors have been known to sink and crack due to the fact that the earth under your garage floor has compacted and you are now effectively driving over a bridge. Your garage floor may become uneven due to winter snow and ice which melts when you park your car in your garage. Some garages do not have a drainage system or the drain that you have may be clogged and not functioning correctly. When snow melts from your car, the water may run to the side of the garage by the wall, get into cracks, seep into the soil and the garage floor begins to settle. When that happens, a void is created from the erosion and your garage floor is becoming more and more unstable. 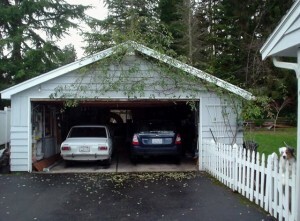 If you don’t believe your garage floor could collapse, you may want to think again. Using a small hammer, tap on the floor of your garage every 3 to 4 feet. Pay special attention to areas on your floor around your car where water may have accumulated. Listen for a same similar sound. If you hit a space on your garage floor that sounds ‘hollow’ chances are, the earth is settling and your garage floor may be compromised. Does your floor have small cracks in the cement ? Does your floor shake slightly when the car is driven over it? Can you hear the “spaces” when your tires drive over the void. If you think you may have such a situation, ask a friend or a relative to stand in your garage when you drive in. Do they feel a slight movement in the concrete? Do they hear the difference when your tires move over the concrete? If the answer to any of these tests is positive, your garage floor may be on the verge of sinking. Call us. When you need a quote for garage floor leveling repair, call the foam lifting experts, Concrete Raising Systems. If your garage floor can’t be raised, we’ll let you know if it needs to be replaced and why. If water is pooling in your garage or if you start to see some cracking or if the floor sounds hollow when you drive over it, call us (816) 419-8306. We can evaluate the extent of your garage floor repair.